Remittance processing - Solutions for government & business. Back office conversion. Payments! (for businesses) and TAXMANager (for county treasurers) provide a payment collection tracking system using number- or bar-coded coupons and accompanying checks. 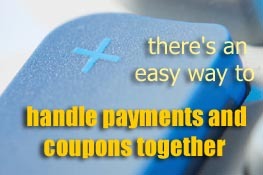 Each solution simplifies and speeds processing payment coupons, and handles multiple checks covering one payment, and one check covering multiple payments. ACH options - there are three ways for businesses to clear checks through the Automated Clearing House: POP, ARC, and BOC. See how they compare to each other . check scanner choices - single feed or batch scanning, one- or two-sided scanning. Digital Check. Canon. Magtek. Copyright � 1998 - 2007 WitsEnds Software .